"I represent the African-American women who are victims of gun violence who are simply statistics instead of vibrant, beautiful girls full of potential." An 11-year-old girl stole hearts across the country with a passionate speech at the March For Our Lives rally in Washington D.C. Saturday. Her name is Naomi Wadler, and she came to the rally with a mission. "I am here today to acknowledge and represent the African-American girls whose stories don't make the front page of every national newspaper, whose stories don't lead on the evening news," she said. 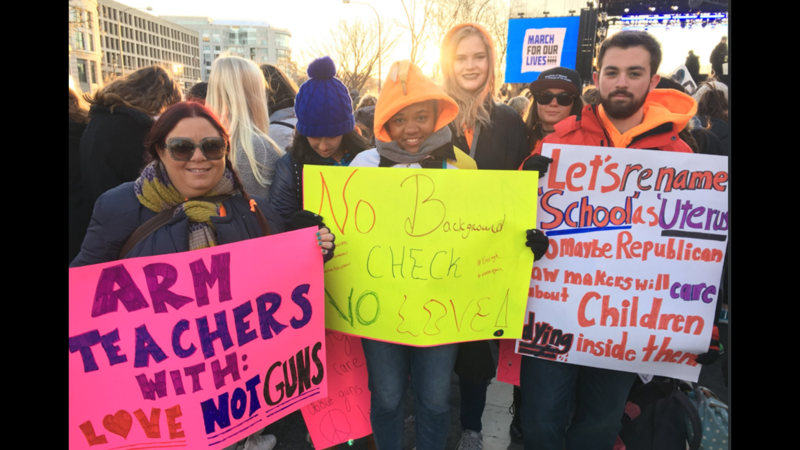 The Alexandria, Va. native said she and her friend Carter organized an 18-minute walkout at her elementary school on March 14. While most walkouts that day were 17 minutes, Naomi Wadler said she added a minute in honor of Courtlin Arrington, a teen victim of gun violence at an Alabama school after the Parkland, Fla. school shooting. "I represent the African-American women who are victims of gun violence who are simply statistics instead of vibrant, beautiful girls full of potential," Naomi said. "I am here to acknowledge their stories, to say they mattered. To say their names. Because I can. Because I was asked to be." Wadler acknowledged she was "full of privilege" and wanted to use her voice to spotlight victims of gun violence like Arrington. Like Taiyania Thompson, a 16-year-old girl shot and killed earlier this year in Washington, D.C.
"For far too long, these names -- these black girls and women have been just numbers. I am here to say NEVER AGAIN for those girls too," she said. "I am here to say that everyone should value those girls too." "People have said that I am too young to have these thoughts on my own. People have said that I am tool of some nameless adult. That's not true," Wadler said. Wadler had a message to those who might not heed her words. "My friends and I might still be 11, and we might still be in elementary school, but we know. We know life isn't equal for everyone and we know what's right and wrong," she said. "We also know that we stand in the shadow of the Capitol and we know that we have seven short years until we too have the right to vote." The elementary school student shared a quote from Pulitzer Prize-winning writer Toni Morrison: "If there is a book that you want to read but it hasn't been written yet, you must be the one to write it." In closing, Wadler urged those listening to "help write the narrative for this world and understand so that these girls and women are never forgotten." Organizers estimated that the March For Our Lives was attended by approximately 800,000 people.